There are many booths to see while walking around the CE Week 2015 showfloor. Some have headphones, others have wearables. But one stuck out as being the only booth that was serving beer at 9AM. Fizzics, a Manchester, NH-based company, displayed its product of the same name, which is coming to market later in 2015. It's a glorified beer dispenser that utilizes a unique mix of pressurization, controlled dispensing and, to my surprise, sound waves to enrich the pour, aroma, mouth feel and the taste of your favorite beer, no matter the quality. Using Fizzics is simple by design: flip up its top and insert your beer of choice into the canister. It supports any type of beer, so long as it's carbonated and no larger than a 64oz growler. Hanging down from the lid is a tube that feeds into the beverage. Shut the top and pull the lever toward you and the Fizzics machine will begin to go to work on the beer. 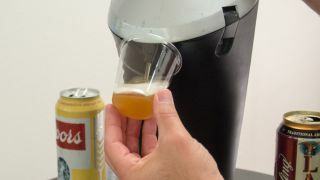 Fizzics creates a pressurized environment similar to that of a keg, pulling beer up through the tube at a controlled rate of speed to ensure a smooth, draft-like pour. Once you've filled your glass, switching the lever in the backwards-facing direction activates the machine's secondary feature, dispensing a creamy, delicious and foamy head. This is where things get interesting. To do this, Fizzics agitates the remaining beer with sound waves, essentially chopping up the bubbles to release as much flavor and aroma as possible. Doing so also improves overall mouthfeel, turning any ordinary beer into something that its brewmasters would be proud of. While India Pale Ales are my preference, Fizzics turned an off-the-shelf raspberry porter into something truly delicious, full of flavor and enlivened with a fizz that was satisfying and clean. Coming off of a successful crowdfunding campaign, the Fizzics team seemed confident at CE Week 2015. The reps said very little, leaving most of the talking to the device itself. It makes sense. The beer that I tried got a hearty kick in the pants with Fizzics' fizzy wizardry and I'm keeping this device on my watch list.